Well, well, well! Just when it seemed like the season had run out of gas like Gabriel’s jalopy, things get real interesting in “The Key,” thanks to a series of fortunate events and some new characters (and I do mean characters) who literally come out of nowhere. Seems safe to say that most TWD viewers now line up in one of two camps: those who are sick of Negan and want him to die, and those who love Negan and also want him to die. By the end of this hour, we’re left with more questions than answers, but all signs point to the beginning of the end for both the Saviors and their bat-loving leader. The episode fittingly opens with close-ups of Negan, Simon, and Dwight, the Savior triangle that’s fracturing in a way that spells trouble for both groups. Dwight begins with his sympathies to the Hilltop survivors intact: While everyone else is loading up on zombie guts for their “psych ops” assault, he’s plotting to head off alone, presumably to warn Rick and Maggie about what’s coming. But Simon has other ideas. At first, he’s fallen back in line with Negan, making it clear that their goal is to scare, not massacre — wound a few, dirty them up with entrails, let ‘em turn. Everything changes when the Savior road caravan grinds to a halt and Negan vanishes. Simon tries to get Dwight to open up as they head out alone: “Let’s rap here. Let’s get candid. Let’s get weird. Nobody here but us chickens. Top guy to top guy.” Simon’s take? Negan’s “messages” aren’t working. The only way for the Saviors to survive is to “make new relationships” and “move on from past discomforts,” a.k.a. Rick’s people. That resonates with Dwight. You can see him thinking that maybe his role is to lead the Saviors away from Hilltop, save everyone from Negan’s reign, and live longer than he thought he would. Hold that thought while we check in with Hilltop, where Coral’s loss is still being felt. Rick shares a nice moment with Judith and exchanges knowing looks with Daryl, who gives Rick a nod as if to say, “Told ya I’d git her here safe.” (If there is an enduring love story on this show, it’s between these two brothers from other mothers.) Rick looks like he’s ready to cry again and Daryl asks if he’s alright. “I’m gonna be okay,” Rick says, and neither Daryl nor the rest of us quite buy it. But he’s damn sure ready to fight, and in true Rick Grimes fashion, he makes some decisions with his vengeful heart, not his head. He tells Daryl they should split up, which is never a good idea. 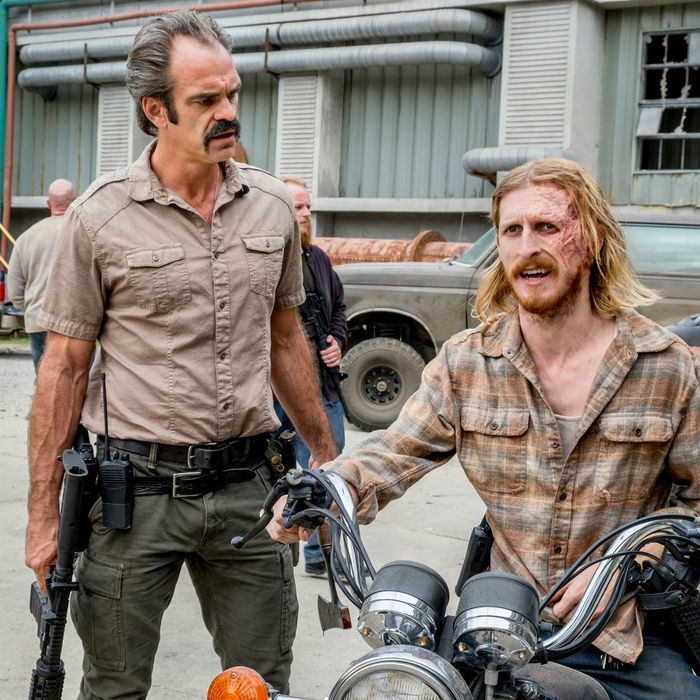 And rather than warn the others of the coming Savior caravan, he sees Negan behind the wheel and turns the episode into The Not So Fast and Furious. Rick T-bones Negan and chases his archnemesis into an abandoned building while wasting so many bullets that his assault rifle and his Colt both run out of ammo. With any shred of realism, Negan would be fully perforated before he reaches that door. Instead, a lengthy close-quarters combat breaks out in the darkness. Rick almost chops Negan’s hand off! Negan falls two stories and is fine! Rick lights Lucille on fire and still can’t manage to kill Negan! Zombies get punched in the face! Negan lives up to his self-professed rep as a “goddamn cat” and escapes somehow! No one is prepared for what awaits at the meeting point. There’s a blue van in the middle of the road guarded by Hilda and Midge, two twin-looking toughs in sunglasses, hats, and camo. Out steps U.S. Senator Elizabeth Warren — er, Georgie, who’s wearing round frames, a seersucker jacket, and sensible slacks. (Is she living in an abandoned Ross Dress for Less?) Georgie isn’t here to swap goods — she’s got knowledge, and in return, she wants some jams, people — so none of that spoken-word crapola, y’hear? “It’s an act of benevolence,” says Hilda the hype-woman. Georgie gives off a friendly motivational speaker vibe, like Tony Robbins, and is creepily serene, also like Tony Robbins. Maggie forces them back to Hilltop, where Michonne pulls the Carl Card: We need to keep fighting, but we also need to be who he wanted us to be. Mags agrees to let Georgie’s gang skedaddle before the Saviors arrive. In return, Georgie not only gives them a generous supply of grub, she hands over the aforementioned key: a handwritten book titled (a bit too on the nose) A Key to the Future, and subtitled “…of medieval human achievement, so that we may have a future from our past.” Wanna learn how to build aqueducts and windmills? Refine some grain? Maybe erect a pyramid or Stonehenge? It’s all in there, I think. Georgie mysteriously says she’ll be back someday and will expect “great things,” as well as cheese and pickles for her hype-women. Then off she goes to who-knows-where because no one really asked what her friggin’ deal was. With our heads still spinning from that development, chaos reigns elsewhere. Simon blows off Negan and rallies the Saviors to follow him, but not the way Dwight assumed: He now defines “moving on” as a full-on Hilltop assault meant to “expunge … redact … erase.” In a sense, Simon is worse than Negan, who’s at least willing to reduce his rates and give Rick a job as a janitor. So Dwight is fairly horrified that he’s now stuck with this mass murderer, and Rick is left wondering where Negan ended up. Bet he (like me) didn’t guess Negan was riding shotgun at gunpoint with Jadis. Even Neegs can’t help but chuckle at his luck. If he can convince her that Simon went rogue when he slaughtered her junkyard pals, Negan might have an ally to help him take out Simon and Rick. Even so, the momentum is swinging toward Hilltop now, and with three episodes to go, it’s looking like Negan’s reign is almost over.